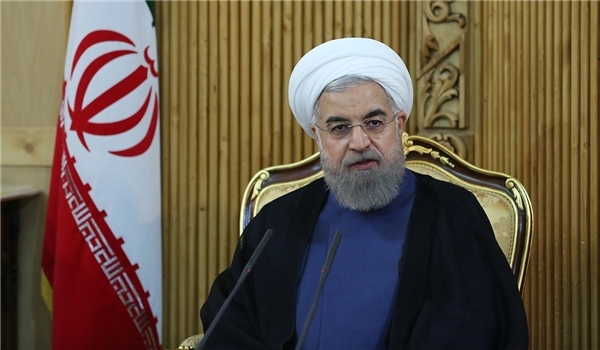 Iranian President Hassan Rouhani announced that trilateral talks will be held among Tehran, Moscow and Baku on regional developments, specially fighting against terrorism. “It is the first time that Iran, Azerbaijan and Russia have a trilateral meeting and it will be highly important regarding relations with our neighbors, the conditions of the Middle-East region and the Caucasus, and stability and security in the region,” Rouhani told reporters before leaving Tehran for Baku to participate in the trilateral summit with his Russian and Azeri counterparts on Sunday. He said that the officials of the three countries will confer on ways to increase cooperation on regional issues as well as campaign against terrorism. Elsewhere, President Rouhani underlined holding discussions on Astara-Rasht railway whose construction is underway, and expressed the hope that it would be launched by the end of this year. Late in April, Iranian and Azeri officials conferred on the two countries’ cooperation to fight against terrorism and extremism, and stressed the need for settling the Nagorno-Karabakh crisis based on the international laws. The meeting was held between Iranian Communications and Information Technology Minister Mahmoud Vaezi and Azeri Prime Minister Artur Rasizade in Baku at the time. Iran and Russia are also cooperating in fighting against the terrorist groups in Syria with big achievements gained in the past few months.